In the last two decades, the department of Madre de Dios, located in the Peruvian Amazon, has increasingly struggled with illegal and informal gold mining. As a consequence, the area known as La Pampa, located in the buffer zone of the Tambopata National Reserve, has been invaded by thousands of so-called artisanal gold miners. According to the Monitoring of the Andean Amazon Project, 560 hectares of forest were destroyed in La Pampa just between April 2016 and September 2017. In the last 15 years (2001-2016), an estimated 162,000 hectares of forests have been lost in Madre de Dios to mining, illegal logging, and land use change for agriculture or livestock. The region reflects national trends; in 2016 164,662 hectares of the Peruvian Amazon were deforested. It’s a complex issue. But now WWF, Wake Forest University (WFU), CINCIA and USAID are implementing an innovative approach for restoring landscapes deforested and degraded by artisanal gold mining. This partnership is applying new scientific and technological methodology to reverse some of the major impacts of mining in the country. "This project, that began in 2015, initially aimed to recover 42 hectares in pilot plots. In 2018 it will reach an additional 140 hectares reforested with more than 155,000 trees, in two of the areas most affected by mining: the Madre de Dios district of Inambari and the province of Manu. 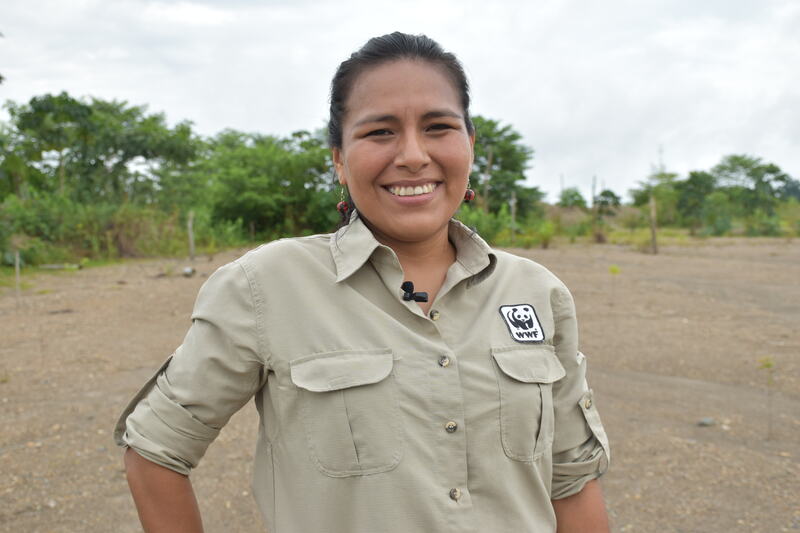 Thanks to this initiative, we are seeing soils that had completely lost their fertility come back to life for the first time," says Edith Condori, project coordinator for WWF-Peru. The process starts in a lab, where CINCIA, in alliance with the Research Institute of the Peruvian Amazon, evaluates the presence of mercury in the soils of 42 hectares dedicated to experimental plantations in the forests of Cusco and Madre de Dios. In these highly disturbed lands, CINCIA’s team of scientists analyze the natural regeneration capacity of aquatic and terrestrial ecosystems affected by mining and test potential approaches to support those natural processes, to develop successful models of environmental restoration. The charcoal alters the chemical properties of the soil and the availability of nutrients. It also increases the carbon present and provides a habitat favorable to microorganisms, returning the fertility to the soil. “Therefore, this land can recover its capacity to retain water, nutrients and microorganisms," explains Francisco Román, Scientific Director of CINCIA. Innovation extends beyond the lab as well, not just in search of results but also to generate greater efficiency and better resource use within the project itself. 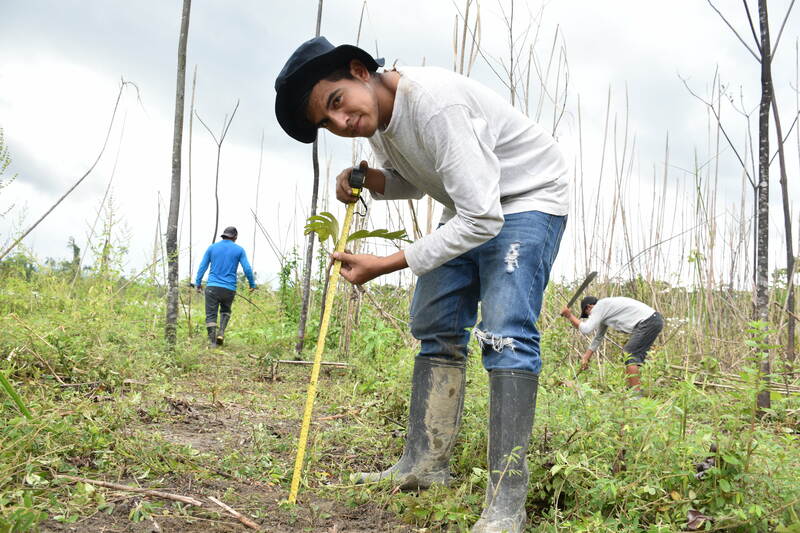 In line with this, the first high-tech forestry nursery has been built in Madre de Dios, in alliance with the District Municipality of Inambari, one of the areas most affected by gold mining in this region. The nursery supports the production of seedlings, reaching 240,000 units per year compared to the 10,000 that were achieved with traditional methods. Similarly, today it is possible to monitor the progress of mining in the Amazon and know its impacts thanks to a geographic information decision support system developed jointly with WFU and CINCIA. This virtual tool also allows one to visualize the actions that are being undertaken to restore these areas. The scale of these results has attracted more than simple interest. Local municipalities and ministries have joined the initiative, investing almost USD 800,000. The Ministry of the Environment has committed to allocate over USD 300,000 for the Provincial Municipality of Manu to assume the task of reforesting and recovering 60 hectares, where it is expected to plant 66,000 trees throughout 2018 with the participation of 10 indigenous communities, including the Harakbut of San José de Karene, Puerto Luz, and Shintuya. The Ministry of Agriculture and Irrigation, through SERFOR (Peru’s National Forest and Wildlife Service), has also committed to finance the recovery work conducted by the Municipality of Inambari. The tangible commitment shown by Peruvians towards the conservation of their forests and this project was also highlighted this March, during Earth Hour. That day, WWF, CINCIA, and the Municipalities of Tambopata and Inambari planted 1,000 trees in degraded areas. With the Mayors of Tambopata and Inambari joining as an Earth Hour Ambassadors, these trees will breathe new life into large areas of rainforest, increasing the impact of the reforestation and restoration initiatives. "The most valuable aspect is the combination of science and political and social commitment. Now, the priority is to continue replicating this in other locations in the Amazon with the support of local and regional governments," concludes Condori. Future plans for the project include the implementation of two new technified nurseries in the localities of Salvacion and Boca Colorado and providing the municipality of Manu with a modern Geographic Information System and drones whose photos and videos can facilitate the proper monitoring of work in progress. "Science has been the starting point to tackle such a complex problem. From the research and experimentation of different options to find the most efficient production of seedlings, to the use of geo-spatial information to determine the most appropriate grounds for recovery and the use of drones for monitoring: science has been at the core of our conservation approach," says Nelson Gutiérrez, scientific leader of the initiative in WWF. "We are using hundreds of camera traps and acoustic recorders to monitor the behavior of wildlife and are constantly surprised with the density and diversity of species, even in areas with human presence where there were serious impacts before, and where today activities are conducted in a sustainable and responsible manner," continues Gutiérrez. 182 hectares of recovered forests is a large area, and its impact is exponentially magnified when inserted in a landscape connectivity and recovery approach. "Through this project, we could be potentially connecting hundreds of thousands of hectares in the most biodiverse forest in the world," Gutiérrez concludes. Through this project, technology, political commitment, and local peoples’ engagement are working in greater harmony to ensure an ever greener future for Peru’s southern Amazon.